I feel like the best way to test products out are through samples! If you're a beauty addict like we are, you would most likely already have a drawer full of samples just waiting for you to try out. I've heard amazing things about Apivita, word has it that it smells amazing, makes your hair feel nourished and lives up to expectations of the product description. Having read those reviews, I was pretty pumped to give them a try too! So here's a short first impressions post and I'll be showing you how you can redeem your own trial kit ! Lets go! 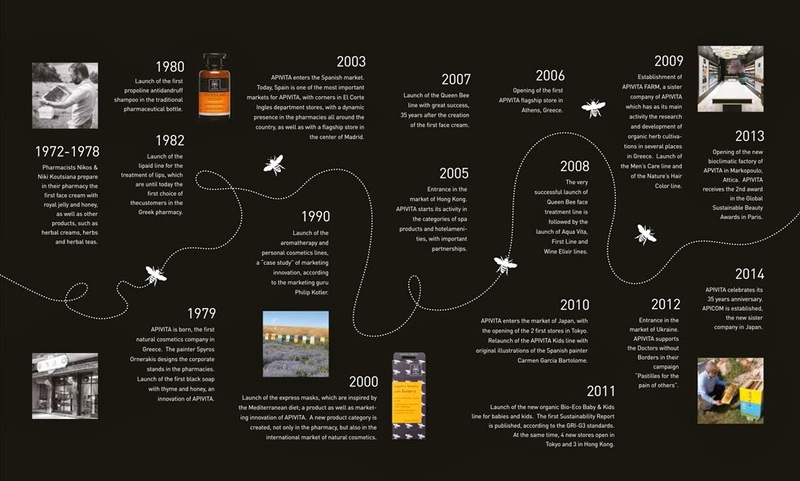 Since 1979, Apivita has developed a unique philosophy to create every product by combining 3 different elements, Nature, Effectiveness and Holistic well-being. All of Apivita's products are free from animal testing, silicone, GMO'S, parabens and petro-chemicals. In Apivita, we believe that every detail matters when creating and developing each product. With this philosophy, Apivita promises and delivers effective cosmetics products that provide solutions to counter the consumers needs and problems. Our formulas include bee products of high biological value and proven effectiveness such as propolis - nature's miracle antiseptic. 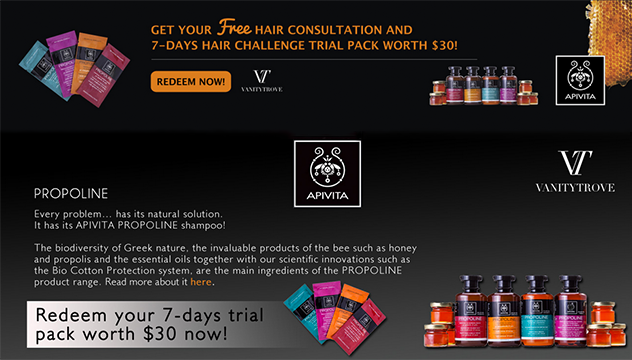 Propolis enforces the effectiveness of Apivita's products thanks to its antiseptic and antioxidant properties. 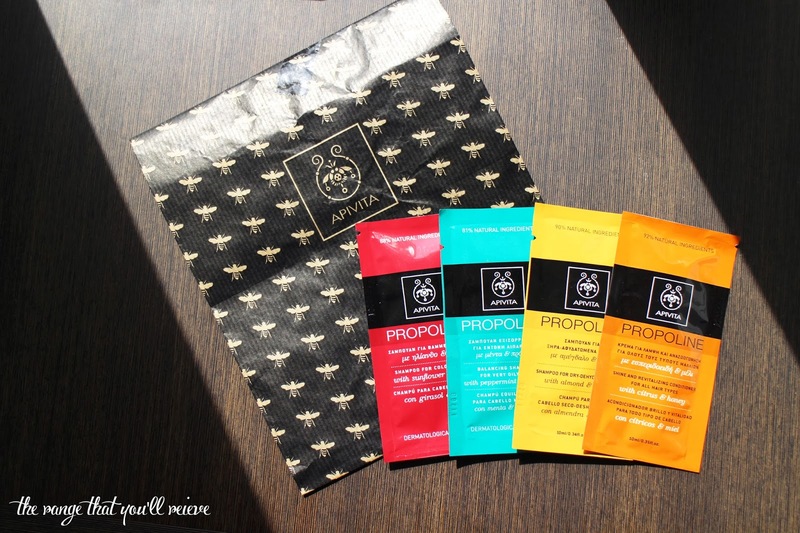 You will receive a total of about 8 sachets, each sachet targets different hair types, be it dry, frizzy or oily hair, there's bound to be a set of shampoo/ conditioners for you! The biodiversity of greek nature, the invaluable products of the bee such as honey and propolis and the essential oils together with our scientific innovations such as the Bio Cotton Protection system, are the main ingredients of the Propoline product range. I have very dry ends and am always looking for ways to amp up the hydration within my haircare routine to have luscious locks. I'm not sure that we will all be receiving the same lines but! out of the 8 that were given to me, here are my 4 favourites! Helps preserve hair color and protects it from solar radiation, damaging effects of the environment and styling products with the sunflower extracts. It also improves hair texture and maintains hair's natural hydration and softness with honey. Recommended for: Coloured or dry/damaged hair. Helps regulate excessive oiliness with rosemary, propolis and deeply cleanses scalp without irritations. It also sets out to maintain hairs natural shine and hydration without weighing it down or making it feel too heavy. Recommended for: normal hair with a tendency of oily roots or hair with periodical oiliness. Helps hydrate and restructure dry-deyhrated hair with wheat proteins, honey, aloe, almond and olive oil. This shampoo nourishes hair with almond and olive oils and protects from split ends with panthenol and phytantriol. 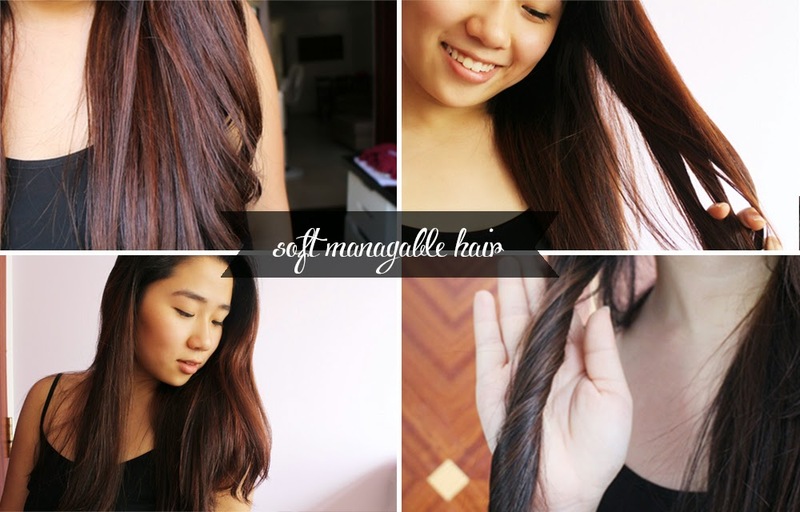 It also sets out to restore hair's natural softness, shine and elasticity. Recommended for: Dry hair, hair with splits ends and damaged hair due to perms and styling. Revitalizes hair leaving it shiny with lemon, orange and grapefruit essential oils. It energizes and tones hair with ginseng, trace elements and vitamins within helps protects the split ends with panthenol and phytantriol. It also further maintains hair's natural hydration and elasticity with honey thats present within.It also offers anti-aging protection for all hair type sot tone and strengthen hair conditions. Almost instantly when you start lathering the shampoo up into your palms you can already smell the sweet honey scent that come with the shampoo, don't worry it's nothing thick or musky, it's got just the right amount of fragrance that leaves you smelling fresh and light. 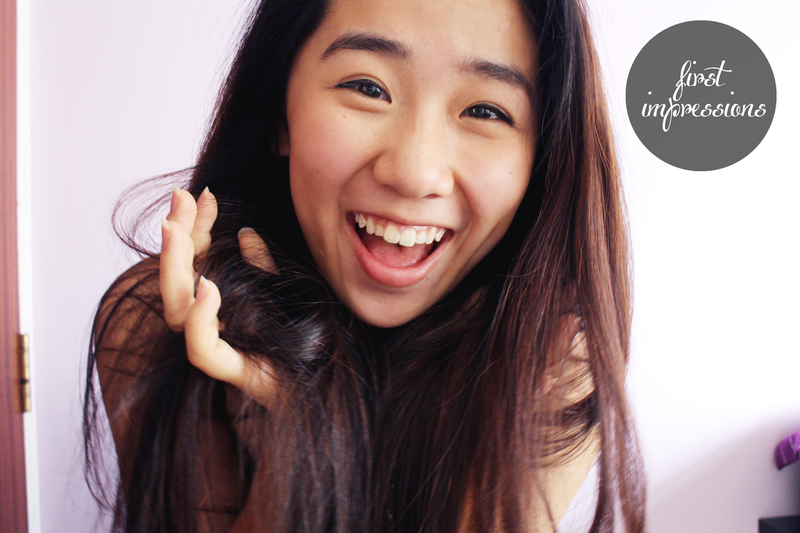 For this post, I used the Apivita Propoline shampoo targeted towards coloured hair (Red) and the Conditioner for dehyrated hair (yellow) to whip up the perfect potion to target all my problem areas with my hair.My hair was incredibly soft after and without styling products or styling my hair at all, here's what my hair looks like right after one use! It tames all the frizziness that was once there and I can actually run my fingers through my hair without my hair getting all knotty! 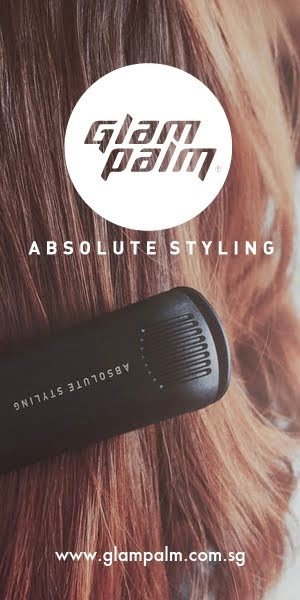 I feel like with this product, I can actually skip styling it or even brushing my hair out on days where I'm in a hurry to get out the door. It's great to know that my hair doesn't react badly towards the APIVITA hair care line like they do towards strictly sulphate free products. My hair just turns into a rough, dry mess and nothing goes right. So, if you're looking for a new shampoo/ conditioner why not pick these babies up and give them a go to see if they float your boat ;)? Grab your 7-day trial today! The steps are incredibly simple! 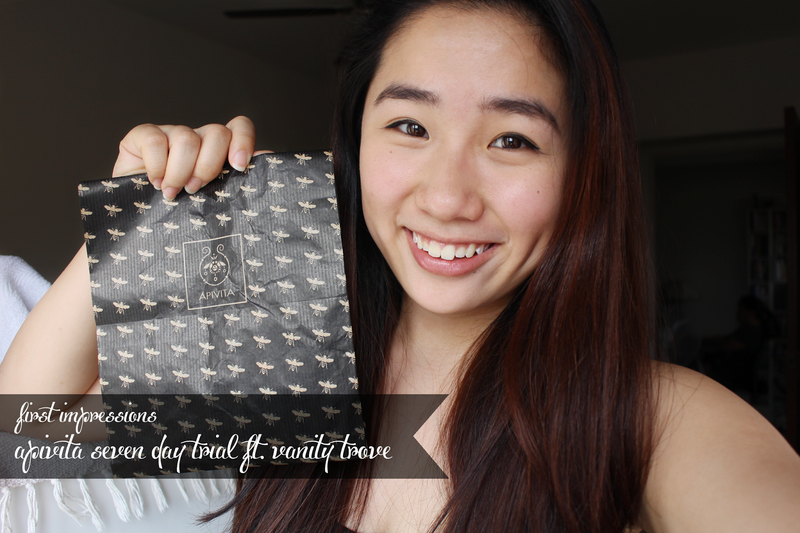 Head on over to APIVITA's page on vanity trove and hit the redeem button! 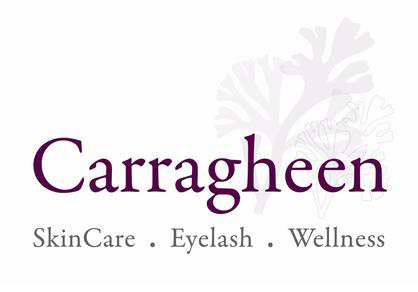 You will have to fill out a survey identifying your hair type, concerns etc, this is probably to ensure that they prescribe you with the products you would use to find a favourite amongst them all. Nice post! 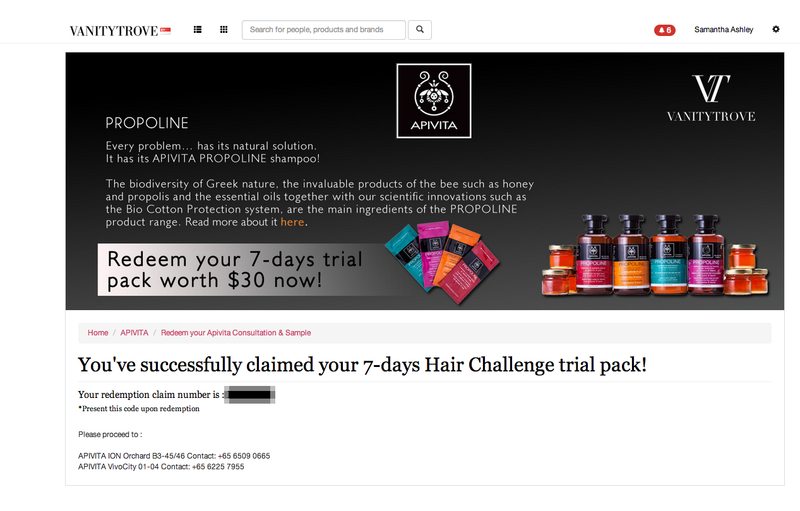 Next time I get samples from Apivita I will ask for the yellow shampoo sample ^^. I'm actually looking for help, I'm living in HK now and humidity here is making me crazy, my hair is imposible to handle lately, especially in rainy days ( I'm from South America and well humidity in my city was never this strong). Can you recommend me any product? or should i go to a salon and get a treatment? Thank you!!! yes you should definitely try it out! It helps tame hair like nothing else.